Every customer wants and deserves excellent results. Absolutely no one sets out to pay for a service and expect to get treated poorly and obtain a less than satisfactory outcome. In fact, it is probably safe to presume that all clients want the best value for the money they’re spending on something. The same is particularly true for customers who are searching for the right trucking company to partner with and to handle their precious cargos. Who in their right minds, after all, would entrust priceless shipments in the hands of a trucking company with a reputation for being inferior to all the rest? It’s a great thing that superior results, excellent service, and comprehensive coverage are all made possible by Conway Trucking. Conway Freight is a major division of Conway Inc., which was founded in 1929 by Leland James with the original name of Consolidated Truck Lines. Initially a little regional trucking business based in Oregon, the company grew through acquisitions and expansions, reached incredible levels of success, and was later given the new name of Consolidated Freightways or CF. As time passed by, Leland James’ company experienced several changes. One of the most groundbreaking ones include the creation of a trucking division that would cater to all the places that weren’t fully served by Consolidated Freightways. 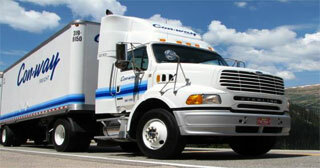 To offer regional short-haul services to these markets, Conway Trucking was founded. Scores of service centers were set up, and regional companies such as Con-way Western Express, Con-way Central Express, and Con-way Eastern Express were launched. Judging by the first day’s number of cargos, with a total of 113 shipments for all three entities, customers were delighted with the opening of the said companies and were eager to do business with them. With the use of 334 tractors, trucks, and trailers and the assistance of 230 company employees, all these shipments gave clients a taste of the years of excellent trucking services to follow. Today, this motor carrier headquartered in Michigan has considerably grown in size, has over 365 operation locations, employs 16,600 workers, and utilizes an astonishing 32,750 trailers and tractors to accommodate everyone’s trucking needs. If outstanding service, extensive coverage, and excellent less-than-truckload performance is what you’re looking for, then Conway Trucking should be among your top choices of trucking companies. It has more than enough operation locations to serve your shipment needs, be it delivered across North America, Mexico, Canada, the Caribbean, Europe, Asia, and even other domestic offshore destinations. Regardless of your specific shipment needs, you can be assured that Conway Trucking’s core values of excellence, integrity, commitment, collaboration, and safety will be put to practice every step of the way. Apart from superior transportation performance, you can also expect outstanding customer service at every level of interaction, time-efficient technology and processes, and an overall great experience with the company. It is no wonder then that Conway was named as the “Most Admired Company” in the field of logistics and transportation by Fortune Magazine in the year 2007. When it comes to searching for the company to entrust your priceless and treasured shipments with, you should never settle for less than excellence. Hence, you need not look further than Conway. The convenient conway freight tracking is just another awesome feature that makes Conway one of the best trucking company.